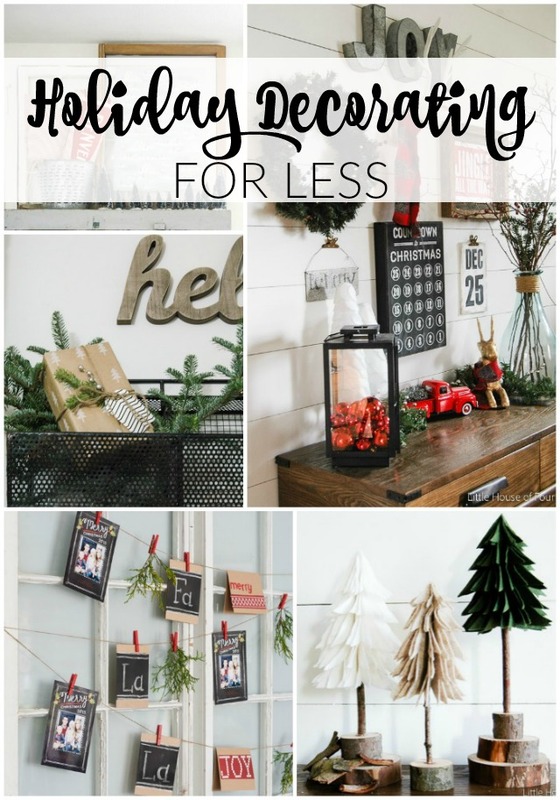 This past week has been full of Christmas decor and projects, so I thought it would only be appropriate to end the week with a few thrifty holiday decorating ideas. If you're anything like me then I'm sure you love decking your halls for the holiday's, but hate spending a lot of money doing so. If you think it can't be done, I'm here to tell you it most certainly can. If you are not up to creating your own free art, Pinterest is full of Christmas printables an Etsy even has some really cute instant downloads for just a couple dollars. All you have to do is pop them in a frame or Mod Podge them to a piece of wood or foam board and you have instant wall art. Wrapping paper is great for so many things besides wrapping presents. I've used it in the past to line drawers and also to create artwork for our master bathroom. Liz from Liz Marie Blog recently used some super cute wrapping paper in her own home to create inexpensive large scale artwork. 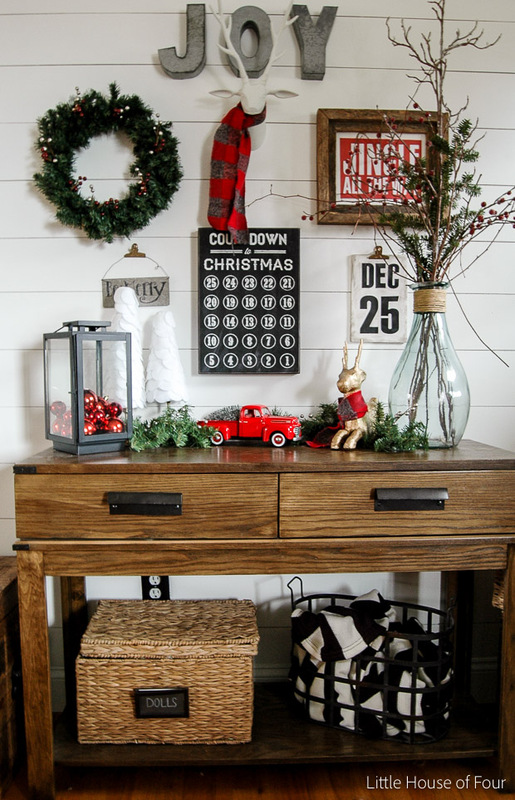 There's no better way to make your home feel like Christmas than the smell of fresh pine. I usually get my greenery for free from a local tree farm. We visit the same place every year and they are always more than willing to let us take the discarded tree scraps that are laying around. Hey, they don't have to clean up and I get free greenery for the house. It's a win, win all around. Having young kids around the house means there won't be any neatly wrapped presents artfully displayed under our tree or around the house anymore. That doesn't stop me from displaying nicely wrapped gifts empty boxes to use in my decor. 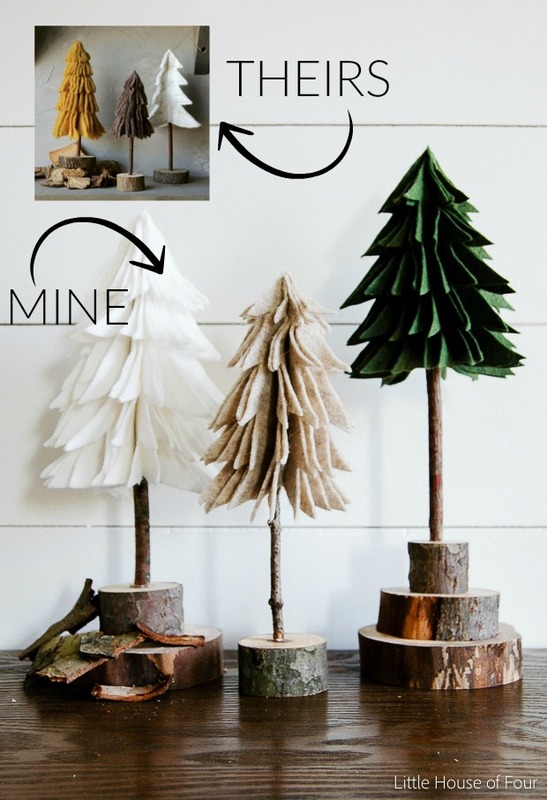 A recycled box, wrapping paper and a cute gift tag can go a long way. 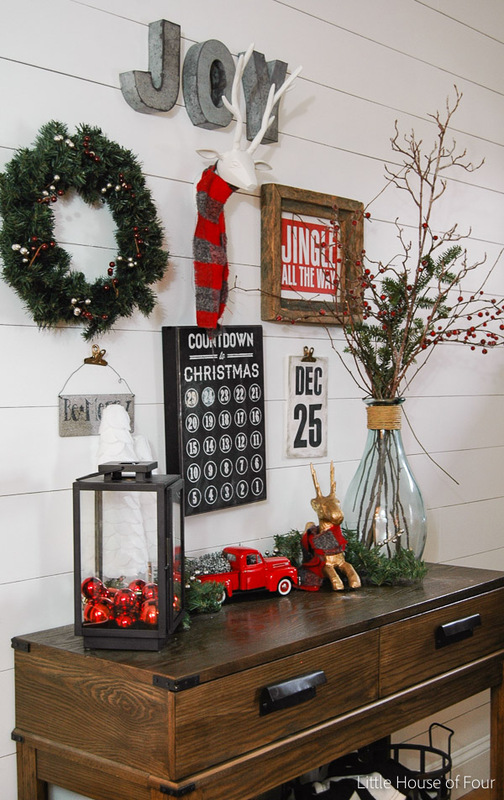 Take advantage of after Christmas sales and stock up on wrapping paper and holiday decor. Lord knows I don't need anymore wrapping paper, but I can never resist the incredible deals. TIP: look for wrapping paper that can be used for any occasion. I can usually find plaid, stripes or brightly colored paper that's perfect for wrapping birthday gifts. Every year I like to DIY a few Christmas decorations to add to my stash. It's an easy an inexpensive way to change out an update my decor without spending a lot of money. This year I made a few felt trees, Dec 25th and "Ho Ho Ho" foam board sign and flannel Christmas bulbs. 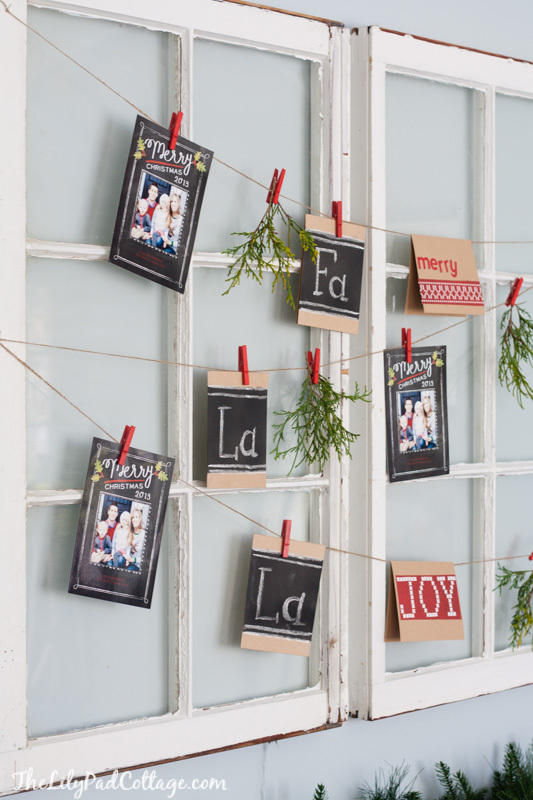 Most people receive Christmas cards every year, why not use them to decorate your home? 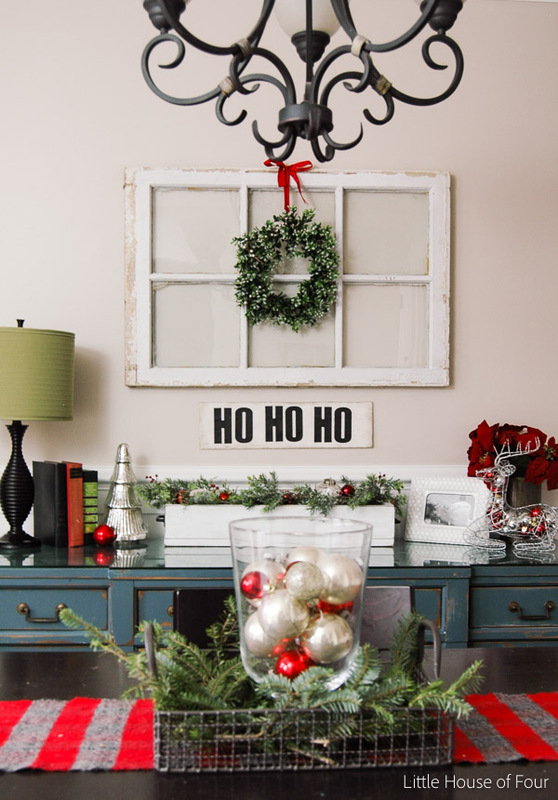 Not only are they free, but it's a great way to personalize your home for the holidays. I love this simple card display idea from The Lily Pad Cottage. All you need is a couple old windows, twine and a few small clothes pins. 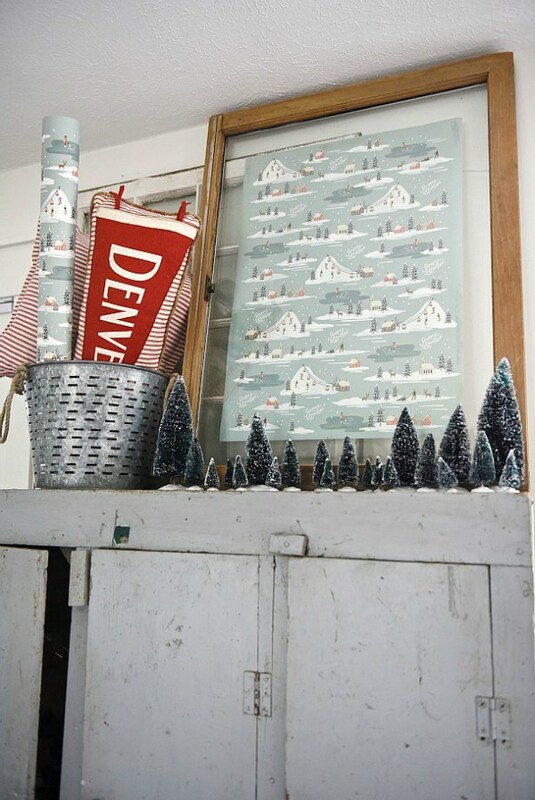 I also love this DIY holiday card display from Lolly Jane. 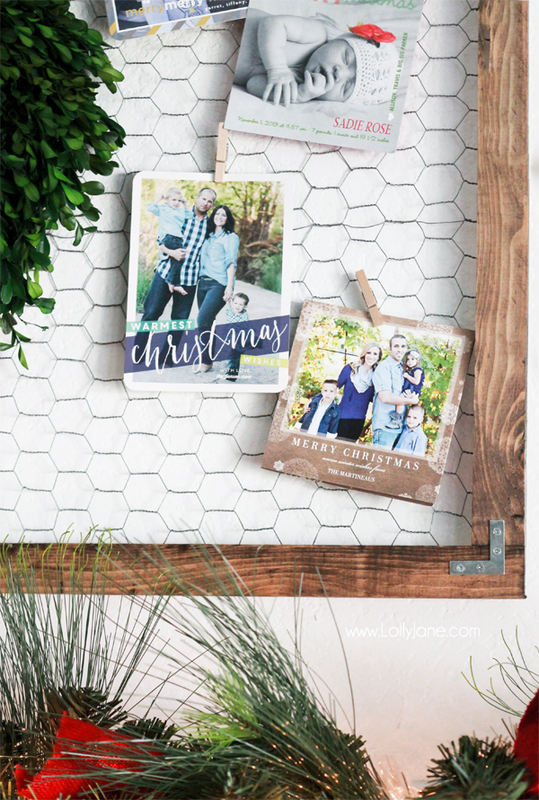 The stained wood and chicken wire frame would make the perfect addition to any rustic Christmas decor. I have fond memories of my cousins and I (all dressed in matching Christmas PJ's of course!) decorating my grandmothers tree on Christmas eve. Looking back, I can't believe she allowed 8 crazy kids to handle her delicate glass ornaments. What was she thinking? Now that I have my own home to decorate I love using my grandmother's ornaments not only to decorate my tree, but to add color around my home. I have some displayed in a vase on my dining room table, in a lantern on our entryway table and in a glass jar in our hall bathroom. If you're not lucky enough to be handed down vintage glass ornaments you can always pick up some super cheap plastic ones from Walmart or the Dollar Store. 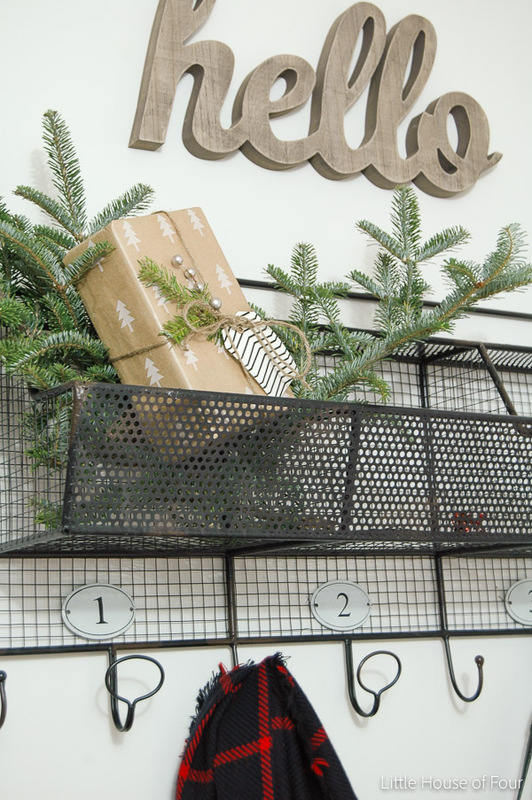 The possibilities are endless when it comes to holiday decorating on a budget. Why spend your money decorating when you could spend it on giving and creating memories with family and friends? Such great ideas here! Love the idea of using wrapping paper as art! These are awesome ideas! I especially love the gallery wall using command strips! I just found your cute little blog (Pinterest:) and I love it! I will be following you from now on. I love the way you come up with unique ways to use ordinary things. You're my kinda decorator/crafter.